Since 2007, French fans were anticipating the comeback of the GazettE in France. On March, 29 2013, almost six years after the first live at Le Bataclan, the dream finally became true when B7Klan released the big announcement. As the band was participating to the Russian festival Kubana during summer and going to do a world tour, it was impossible that the GazettE didn’t stop in Europe for a tour, even if only three countries were concerned for five shows. And great news for France; for his World Tour 2013, the GazettE made a stopover in Paris and Toulouse. This time, for the show in Paris, a hall with a more aesthetic facade was chosen. On September 20th the band was going to perform at Le Trianon for the first date of the step 2 of this tour, after performing in South America. So, on this sunny day, many fans from Europe invaded the long sidewalk of Rochechouart Boulevard, despite of the displeasure of the shopkeepers. Because, like in 2007, the show has been quickly sold out, even if the tickets price was expensive (60.50€ a regular ticket and 93.50€ a VIP ticket including an exclusive gift and a priority access). If many people were disappointed, a lot of them finally bought their ticket to attend the show, including 350 with the VIP status. When you love, you don't count the cost. The entrance was a short precipitated. The fans were rushing into the hall to get the best places in the pit or on the balconies. On the stage, we could see the giant banner with the logo of the band. Fans showed their impatience by clapping their hands and calling the band. And finally at 20 o'clock, a voice announced the rules; no photos, no videos (do we have to say, as usual, that some rebels will use their camera or mobile phone nevertheless? Too hard to resist), and no crush to enable to everyone to spend a good moment. Indeed, it was a good thing to insist. The show had not started yet and some people were already sickness. Few minutes after, the hall became dark. Techno intro [XI] from the album DIVISION began while members were appearing on stage, wearing costumes of FADELESS. It was a smashing beginning; the GazettE started the show in a dark atmosphere with VORTEX, from the album TOXIC. Immediately, the audience showed his enthusiasm and was swept up in a whirlpool of madness. the GazettE decided to begin with force and brought down the audience when LEECH and Before I Decay followed. The white and red lights were dynamic and flashing, whose beams were projected to all sides of the hall. Following this smashing beginning, the GazettE took his first break, and RUKI greeted the audience by saying "Bonjour Paris !" and asking "Are you ready?" while fans were trying to breath to be ready to start over again with GABRIEL ON THE GALLOWS. The title tracks from the last albums TOXIC and DIVISION were the most numerous on the set list. If these albums didn't receive a great response compared to the first albums, tonight, VENOMOUS SPIDER'S WEB and DERANGEMENT were much appreciated. The ballads like UNTITLED were also amazing on live, creating a calm and weighing atmosphere, where almost nobody didn't dare open his mouth. However, we would also have appreciated the beautiful and famous ballad Cassis, which is rarely played during concerts. And it seemed that RUKI didn't bring his guitar, so this song will not be played in France this time. But the GazettE gave a great show and all songs were played without realizing that the time was passing quickly. But the members had to deal with some technical problems, especially AOI and REITA who had to call Staff members to help them. RUKI's mic was also sometimes in failure and his voice was not heard by everybody's ears. Technical problems or not, you have to do more to stop the GazettE. The presence of the members and the imposing attitude of RUKI made the tracks more surprising. RUKI was able to reveal the emotions and the atmosphere of the songs thanks to his vocal skills and his body language. There was the robot RUKI during the intriguing intro of THE SUICIDE CIRCUS, the RUKI lost in the darkness who was trying to reach for the light at the beginning of DRIPPING INSANITY and the devil RUKI who let hear his diabolic laugh during HEADACHE MAN. In addition, AOI, URUHA and REITA delivered electric and amazing solos while they were jumping in the same time of the audience who was also headbanging strongly, mainly people who were on the balconies. KAI was playing with enthusiasm and with a big smile, even if he seemed far from us behind his drums. The fans were happy tonight and enjoyed the show. the GazettE didn't need an impressive pyrotechnics to make this live more awesome than a performance at the Tokyo Dome. However, we regretted that the break times were so long for short talk. the GazettE likes to be desired but the GazettE doesn't make anything to break the barrier between them and their foreign fans. The band spoke a little but stayed distant. Only RUKI was talking and we appreciated some words in French, even if it was the most simple words ("Bonjour", "Ça va ? ", "Merci"). After a last short talk, the band decided to set on fire and increased the tension by announcing SLUDGY CULT. With some musical notes, fury, trance and frenzy took possession of every soul. The members moved on the stage, playing energic solos and duets. Even more with a track which reminded a distant great period: Crockroach. And finally, when AOI took his acoustic guitar, you knew immediately what it was going to happen: the performance of the famous Filth in the Beauty. Together, the GazettE and his army sang while jumping. Latest round of headbang and it was time for the band to leave the stage. Fans called the members for an encore, but time seemed very long before they came back. In the same time, everyone took a paper with a printed black heart. And when the members of the GazettE finally came back on stage, they were all surprised to see this beautiful present, making heart with their hands and RUKI saying in French "Je t'aime" ("I love you"). Following these beautiful words, RUKI announced the encore with SHIVER. This song was far to be the best for starting the encore, especially when we know that according to the tradition, it's a kickoff with Ride with the ROCKERS. But the GazettE made quickly everybody happy when RUKI started to scream "I am, I am RUDER" before playing Ruder. The band was totally excited, giving all their energy in stock. To finish with good notes, the best song was no other that LINDA ~candydive Pinkyheaven~. The fans clapped their hands and danced for the last time before saying goodbye with sadness. By seeing the emotion on the faces of the fans, which some of them were crying, we can say that this live, this comeback of the GazettE in France, was better than we expected. Indeed, the band has not something to prove anymore and held a great show, very great show. But the concert was too short (1 hour and half) and even if it was a performance without faults, little surprises were missing. The set list was constituted well with tracks from DIVISION, TOXIC and more old songs. However, by knowing that the band has got a long discography and that every period of the career was marked by songs which became famous, two or three more songs would have been nice. We also appreciated a performance of FADELESS, the last single which has been released in Europe, or best, some new tracks from the new album Beautiful Deformity. Anyway, the European fans were happy after the live. We already hope that we won't have to wait again six years before the next European or world tour. 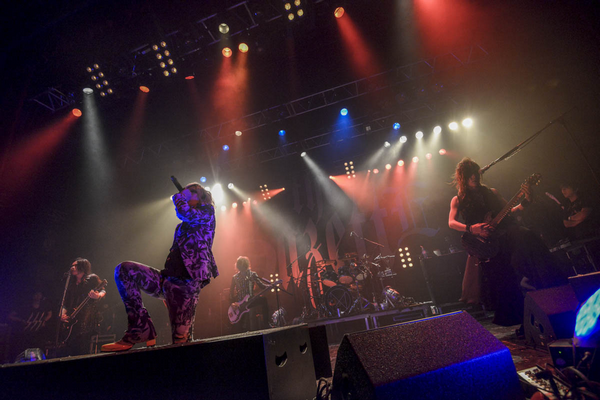 On September 22, the GazettE went to perform in Toulouse for the second date in France. The audience saw a show as awesome as the one in Paris with a set list including three different songs, Hyena, AGONY and Clever Monkey. After two concerts in Germany, the first world tour ended with the live in Helsinki, on September 29. Now back in Japan, the GazettE will embark for his nationwide tour this winter, Beautiful Deformity Magnificent Malformed Box, to promote his new album, with a final called CODA, at Yokohama Arena on January 11, 2014. Special thanks to the management of the GazettE and Jan for the picture. Please find the French version of this live report by clicking on the image above!